Christians usually try to understand creation using the traditional Latin. In the Latin translation, God speaks once and creates things ex nihilo, out of nothing. The Hebrew verbs in Genesis show either continuing actions or completed actions, without using tenses. In Hebrew, God continues to command effects from things made on previous days using verbs that usually show continuing actions. On the first day, God continued to command light to continue to be, evidently giving form to the Earth. Days two through six contain the phrase “and Elohim is saying.” Since these are imperfect verbs, God continues to say. Words can have both verbal and noun forms. To speak is a verb. The speaker is a noun. To run is a verb. The runner a noun: the one that runs. The noun form of the verb raqa, “to continually spread out” is raqiya: “that which spreads out.” On day two, God repeatedly commands let there be “that which spreads out (raqiya)” in the midst of the waters. “That which spreads out” (raqiya) is to causally divide waters from waters. Moses uses the word raqiya five times about day two. The Greek translators of 2200 years ago used their word stereoma for raqiya. During the classical age, philosophers reasoned that the Sun, Moon, planets and stars were attached to crystalline spheres (stereoma) that rotated around the Earth. Hundreds of years later, Latin translators rendered raqiya with firmamentum, for the rotating, solid skies. The King James Version continued the Latin tradition by using the word firmament. Some modern translations use expanse (wide spaces) for raqiya, since planets attached to rotating spheres are no longer scientific. Yet raqiya is the noun of the verb to spread out, so evidently it means the things that spreads. In verse seven, God continues to command that “which spreads” which continues to causally divide the waters under “that which spreads” from the waters above “that which spreads” and it was so. In verse eight, Elohim continues to name “that which spreads:” shamayim (plural heavens). The plural word shamayim means skies. It can refer to the atmospheric or the starry skies. Was God continuing to command spreading stars or a spreading atmosphere? The context fits the spreading atmosphere, since the stars did not begin to spread out until day four. The spreading atmosphere is supported by observations of water ejecting into space along with a gradually forming atmosphere on the Saturnian moon Enceladus. Enceladus has an icy surface, as white as snow. The south pole has a series of parallel groves from which 90 water geysers are jetting out into space. The photo at the head of this article shows geysers jetting into space, taken from NASA’s Cassini spacecraft. Since the Sun is behind the moon, the water plumes are starkly illuminated against the dark foreground. The jets are forming an ice ring, the “E” ring, around Saturn. The plumes also contain gasses, such as methane. Cassini detected a thin atmospheric tail as it passed Enceledus. Evidently, the geysers are jetting out gases along with the water that are forming an ice ring and a thin atmosphere between the ice in space and the surface ice. We observe ice rings around the outer planets, often with a small ice moon orbiting between the rings. Perhaps these rings were also formed by geysers jetting into space. NASA also detected a plume of water jetting into space from the south pole of the frozen moon Europa. The Herschel infrared telescope detected two water plumes from the the minor planet Ceres. The ejecting plumes demonstrate that Ceres has water and suggests that is forming a thin atmosphere. Proverbs chapter 8 describes God’s wisdom in creation. THe Hebrew for Proverbs 8:28 states: When He intensely made solid the thin clouds above, When the fountains of the deep were becoming strong. The word for deep is tehom, the underground seas. The Hebrew in this verse suggests that the early Earth had ice around it, back when the springs of the deep were powerful geysers. 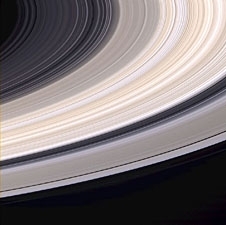 The photo of ice rings around Saturn is in the public domain, since it is from NASA. Today, twenty house-sized snowballs hit Earth every minute on the bow side of our planet (near where dawn is happening ). The ancient snowballs evidently disintegrate far above the atmosphere as they plummet towards Earth but the water vapor leaves a dark streak in the background ultraviolet. Dr. Frank from the University of Iowa, photographed the dark streaks from space. Ten million tiny comets hitting Earth each year suggests that a much of the modern oceans rained down from outer space. Perhaps these are the remains of the ice that formed around Earth on day two. How long was Creation day two? The text uses an unbroken continuity verb to describe the spreading atmosphere, something that continued to happen. If the Earth were forming a nascent atmosphere today, it surely would take geological ages. Moses said it was an evening and a morning, evidently a single rotation of the Earth, yet the Sun was not formed until day four. During Moses day, the notion that (1) time exists had not yet been invented. (2) Ancient people did not “measure time.” (3) Their calendars were for tuning life to the constantly varying cycles of nature. (4) The ancients believed that the duration of life continues to shorten for succeeding generations. Is there evidence that ancient days and years were vast eons? Job compared the duration of life during the dinosaur era to geological events, such as the dried Mediterranean. (Drill cores show that the deep Mediterranean dried repeatedly). Job claimed their faces continued to change (their faces doubled – shana paniym) before they died in Job 14:20. Our brows slowly thicken as we age. If we lived long enough to watch the Mediterranean dry, we would grow Neanderthal features from vast age. The picture of Neanderthal adult skull with the thick brows is from Gibraltar. It is from wikipedia, licensed under Creative Commons Attribution Share Alike by AquilaGib. On the left is the reconstructed appearance of a Neanderthal child taken from a cave in the same area of Gibraltar as the above skull. Notice this child does not have the thick brows of the older Neanderthal. Dental studies of this child’s skull showed heavy abrasion and a high number of striations. This is what one would expect if ancient days and years were vast geological ages. 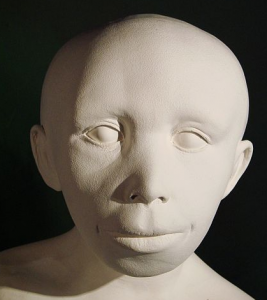 This photo of the facial reconstruction of a Neanderthal child is from wikipedia, licensed under Creative Commons Attribution Share Alike by Guerin Nicolas. If you wonder what could cause days and years to continually shorten throughout Earth history, read about gravity aberration on this web site.